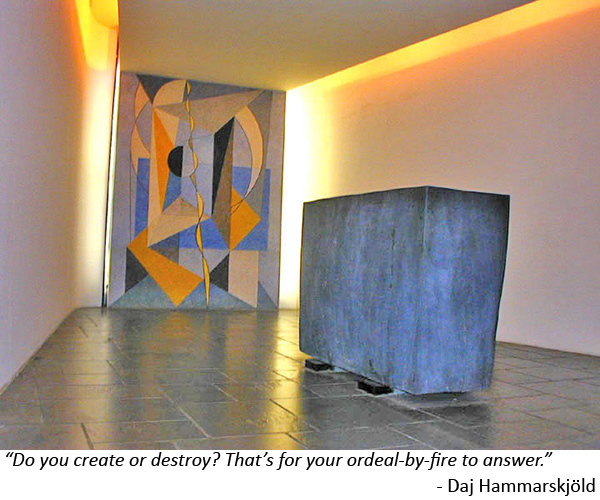 November 9, 2015 November 18, 2015 by Gelinas James, Inc.
Daj Hammarskjöld, the second Secretary-General of the United Nations, thought the UN “should have one room dedicated to silence in the outward sense and stillness in the inner sense.” Because of this he personally planned and supervised the creation of the Meditation Room before he died in a plane crash in 1961 while on a peace mission in the Congo. As you enter this dimly lit, triangular room you face a 9X6.5 foot abstract fresco and a six-and-a-half-ton, four-foot-high, rectangular block of raw iron ore. Although the myriad of decisions we make before, during, and after meetings at work and in our communities might not individually set the stage for us to create or destroy, cumulatively they do. Our choices either create or destroy a sense of connection and community; and diminish or develop our ability to talk well together, solve difficult issues, and make wise decisions. Over time, the choices we make about how to interact affect our organizations, communities, and eventually who we are. What impact do you want your choices to ultimately have on our world? What are your intentions when you meet with co-workers or neighbors? Involve understanding as much as we can about the issues at hand (considering information that both confirms and challenges our current thinking). In other words our intentions benefit us, those around us, and the situation at hand. My intentions, regardless of whether I am acting as a meeting participant, leader, or facilitator, are to help people (1) feel a sense of safety and belonging so that they can contribute their unique perspectives and experience; and (2) work together collaboratively so they can solve tough issues and create a desirable future. Since we never know which meeting or interaction is going to make an important difference, I assume I might as well behave in all of them as if they were a lynch pin event in the life of an organization or a community. What are your intentions for one of your meetings this week at work or in your community?